The 500th anniversary of the Protestant Reformation occasions a new biography of its prime mover. In 1517, Martin Luther revolutionized church doctrine when he posted his 95 Theses on the door of the Castle Church in Wittenberg, Germany, to protest the sale of indulgences in Rome. This biography, set against the backdrop of the late Middle Ages, progresses chronologically toward this event and its aftermath through well-defined stages of Luther’s life. From the cover art’s graphic depiction of the world being turned on its head, through pages reminiscent of a family album, the design is particularly well-suited to the subject. Illustrations resembling etchings are based on archival portraits of Luther, his family, and leading European figures of the 15th and 16th centuries. (Two pages of concluding notes describe their subjects.) While skewed toward a young Lutheran audience, the book has a strong narrative structure that focuses on the profound impact that Luther had on his times, including his translation of the Bible into the vernacular so that ordinary Germans could read it themselves. 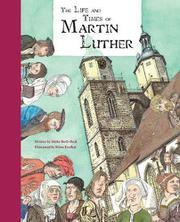 Luther’s religious life, from becoming a monk to being outlawed by the emperor after he uttered his famous phrase, “Here I stand,” is dramatically conveyed through text and illustration. The underpinnings of Luther’s philosophy are clearly articulated in explanations of several individual theses.